Anthony Compagni, known locally as the accomplished executive chef at Benvenuti’s Ristorante and Volare Pizzeria, knew at a young age that his career would involve food. As a boy, he helped cook in his father’s and nonna’s kitchens, and at the young age of 15, landed his first job in a commercial kitchen. After graduating with honors from Scottsdale Culinary Institute Le Cordon Bleu, Anthony worked in some of the most prestigious hotels and restaurants in Scottsdale, Arizona, and Aspen, Colorado. Over the years, he has traveled the world over in search of inspiration for new dishes. As a result, he also acquired a valuable and broad knowledge of the foods, dishes, drinks and spices for which each region was known. Last year, he was able to draw heavily on that knowledge—and those contacts—when he and his partners launched their new venture here: Press & Plow Fine Wine, Spirits and Provisions. 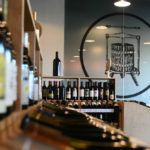 Though a single business, Press & Plow, located at 2596 W. Tecumseh Road, is actually separated into two spaces, albeit next door, because of state laws that prevent a retail wine and spirits shop from being connected to a coffee bar that serves alcohol for consumption. Both sides share a homey, clean, modern-kitchen design vibe and an atmosphere that’s warm and welcoming. The “Provisions” side of the business, which opened last December, offers more than 20 different single-origin, blends and organic coffees as well as over 60 different teas from around the world sourcing the finest hand-picked organic teas and coffees. 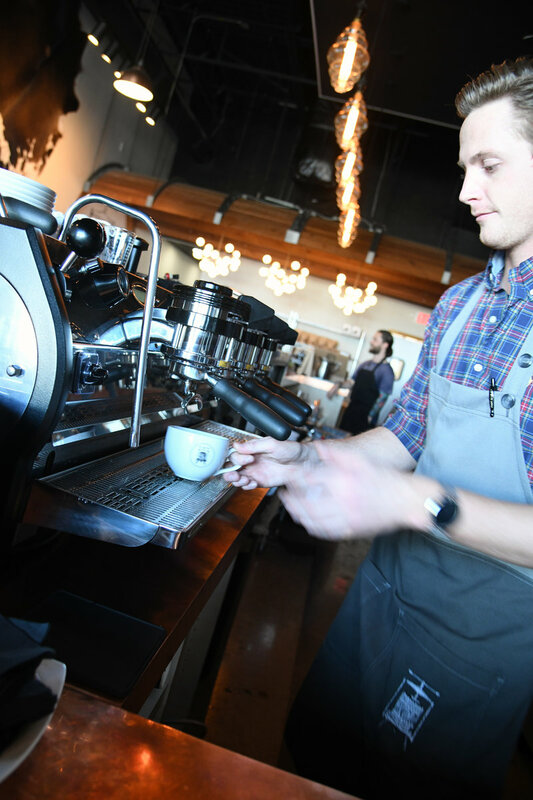 Trained baristas stand ready to prepare customers’ favorite coffees and espressos. Bagged coffees also are sold here, and to help patrons interested in sampling new coffees, Press & Plow includes labels that tastefully describe their flavor, where they were sourced and at what attitude, and how to prepare them. Anthony says his favorite is their espresso blend. “It has the perfect balance of everything you would want in an espresso and is the perfect start for all specialty coffee drinks. It’s a master roasters’ blend of three beans that each impart a particular flavor to produce an ultra-smooth bold espresso that has the perfect balance.” Espressos are made on a La Marzacco espresso maker imported from Italy. Press & Plow also offers draft beers, local and imported, wines and cocktails, including a Mimosa, which Anthony calls “the best in town,” that’s made from organic oranges squeezed that day. Ever tried a Nitro Latte? To the best of his knowledge, Press & Plow is the first in Oklahoma to serve this drink, which is made with small-batch cold brews. Press & Plow additionally offers grab-and-go specials, including salads, sandwiches, muffins and pastries (including some gluten-free) made daily on-site, and a selection of nonalcoholic drinks, including sparkling waters and a kombucha (Big Oak) that’s made in Oklahoma City. Press & Plow also is well-stocked daily with groceries (including artisan imported pasta, sauces, dried herbs, olives, jams—many organic) a selection of freshly packaged salads for those on the go, and an amazing selection of artisan charcuterie and cheeses. 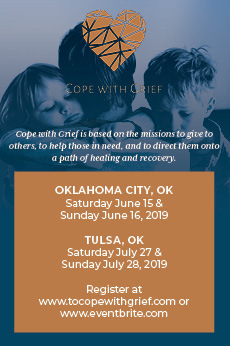 A handful of nonfood-related items also are sold here, including Bisby candles, which are hand-poured in Oklahoma with natural soy wax and chemical-free fragrance oils inspired by international travel. 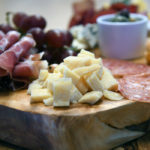 Anthony is particularly passionate about their wide selection of meats and both domestic and imported cheeses, which can be bought individually or artfully arranged on a meat and cheese board. 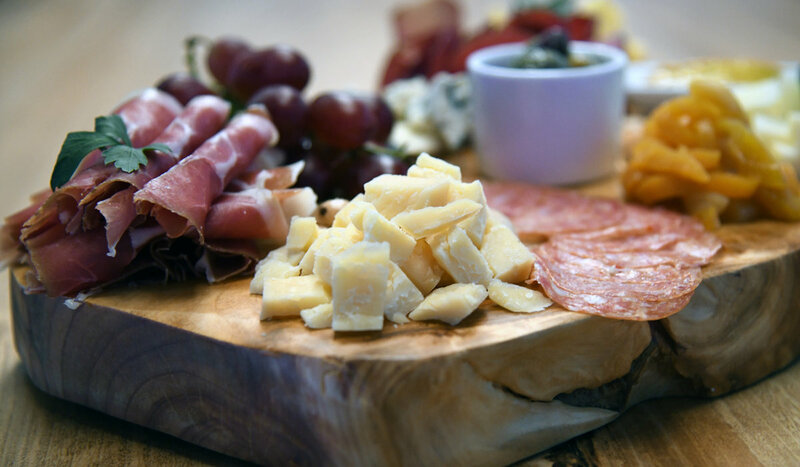 They also offer small Tapas-style appetizers that he describes as “amazing and cleverly thought-out parings of meats cheeses, olives and house-made jams, and pickles, pastries, etc.” Of course, what’s cheese without crackers? Press & Plow offers dozens of styles of crackers, including artisan small batch and gluten-free. Have you ever been invited to a party and remembered just as you were heading out the door that you were supposed to bring food and/or beverages? Press & Plow is your one-shop-stop for both. For example, they can quickly put together cheese boards for any size of party and any budget, and will recommend appropriate wine pairings, which can then be bought next door. 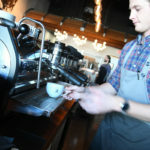 Press & Plow also will work with patrons interested in hosting a meeting, reunion or other event on-site or even to go. Now on to the “Fine Wine and Spirits” side of the business. 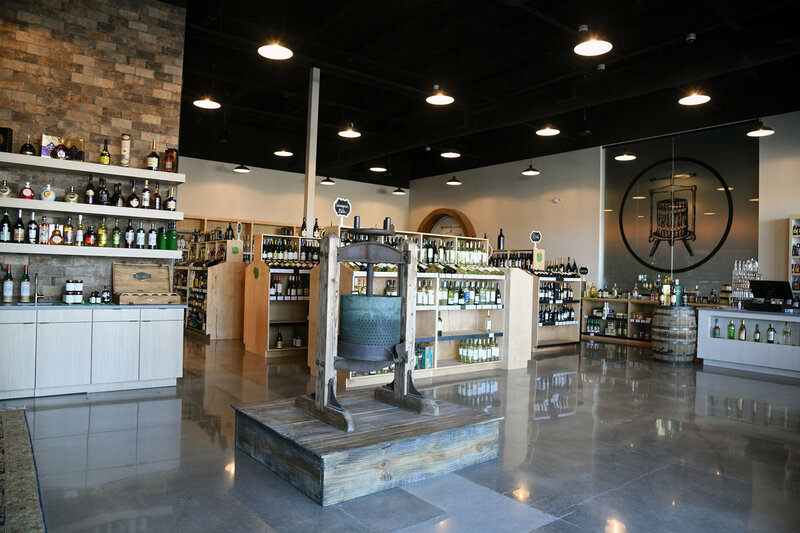 The first thing you see upon entering the wine and spirits shop is a vintage wine press that the owners purchased in Napa Valley. 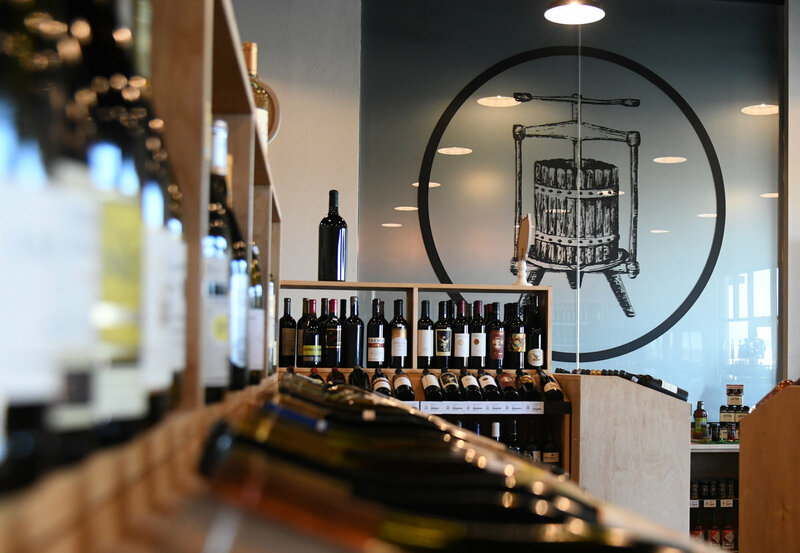 One of the focal points of the shop is a large, temperature-controlled wine room where they store some of their higher-end selections. They also have a huge selection of whiskeys and bourbons, as well as other kinds of liquors; a beer cooler with a wide selection of domestic and imported beers, including a large selection of craft beers; a special barrel of Blanton’s Single-Barrel Bourbon bottled just for them; and a collection of rare wines that you won’t find in your average liquor store. 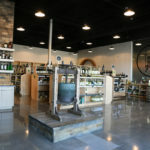 They also offer many “extras,” such Vault ice for bourbons and scotches and a wide selection of mixers, including some of the newest mixology offerings. But the first thing new customers will notice on this end of the shop as well as the other, Anthony says, is their amazing customer service and relaxed, welcoming ambiance. “You walk in, and immediately, Gina Miller and Tanner Atkins, the general managers, greets you into our family and make you feel welcome,” Anthony says. He also lauds Lolly, their beer expert, as well as their other employees for their extensive product knowledge, which allows them to help guests find exactly what they are looking for.